Manorama Arogyam, one of the popular health magazine among the malayali community has published the September 2014 issue. 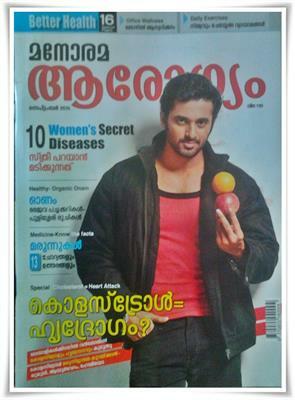 Like its previous editions, the current issue featuring Unni Mukundan on cover is packed with interesting articles related to health. The highlights of this edition are articles on Women's secret diseases and roof top farming. Special focus is given to the topic 'Cholostrol = Heart Attack'. This edition of 'Arogyam' begins with an insightful analyze on the thoughts shared by Dr David Berger in an article titled Corruption ruins the doctor-patient relationship in India"published in a British Medical Journal (BMJ). Dr David Berger, an Australian medical practitioner who volunteered as a physician at a charitable hospital in the Himalayas makes his points clear on the kickbacks and bribes which are prominent in the healthcare machinery of the country. In response to this article, a thoughtful debate featuring prominent doctors in featured in the magazine. Growing vegetables on top of the houses or importance of terrace farming is another delicious article. It highlights the need of roof top farming and gives intuitive steps to grow vegetables. Building willpower and owing to have sustainable development, anyone can start farming with limited budget. As small space is required for preliminary farming, the feature motivates the readers to make a great step in developing a self reliable culture. Heart disease specialist Dr. M.S Valyathan speaks about the need of social medicine. He shares his views on the importance of understanding how social and economic conditions impact health, disease and the practice of medicine. Understanding the social need would foster conditions and can lead to a healthier society. A special feature of 10 secret diseases of women including Chronic Fatigue Syndrome (CFS), Cystitis and Cervical Cancer are given with prominence. A well understanding about the diseases can keep the patient recover from it in the initial stage itself. The September 2014 issue of packed with interesting articles on wellness, health awareness, major diseases and health tips. Published by MM Publications, this magazine is highly read and recommended by doctors and other popular celebrities. Written is simple language, Manorama Arogyam has contributed a lot in developing a health conscious among the malayali community. It is also considered to a good companion which deliver time to time tips to keep fit and healthy.